Meditation Room Design Ideas and Inspiration. Over the years where ever I have lived I was always able to dedicate a room of the house for meditation. 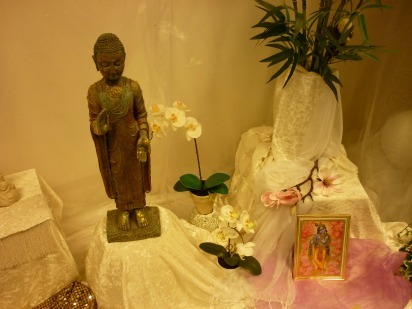 I loved spending time in the meditation room and bring the feel and mood of devotion, love and relaxation into it. It often became my sanctuary and my favorite room in the house to spend time in. A dedicated space for meditation can support your meditation practice greatly as it offers you inspiration, calm and peace the moment you enter it for meditation. The main thing that you want is to create a space that you look forward retreating to. Did you know that people who have dedicate a space in their home are 80% more likely to stick to their committed time to meditate then people who do not have a dedicated space set up! You do not need to dedicate a whole room to meditating. If you have that luxury, great. Be creative when it comes to finding that spot. It might be a forgotten corner in your bedroom or other room, by giving it your attention it can become a great place to sit and go within. It might be as simple as choosing a favorite chair that you love sitting in. It might be a 'space' that you create with a divider screen in a room in your house. The main thing is that you want it to be inviting and a place that you love to retreat to. It is recommended that the place is quiet and away from the daily noises. If you are dedicating a room to meditation you might want to empty it of all furniture and things, if there are any. Like a painter it is a exciting to start a blank canvas and create you sanctuary as you go, step by step. Think about what you like. What pulls you within? What make your feel to go within? What inspires you to meditate more? How do I want to feel in this room? Do you like your space to be light or dark? Feeling like a cocoon or light and open? Do you need vibrant and bright colors around you and have it feel opulant or do you need it to be white and austere? What do you like to sit on? a chair, a cushion, a meditation stool? What picture inspires you? Maybe something of nature? A Saint, a master/teacher? A inspirational quote? Maybe you have a book that inspires you spiritually at the moment. A candle or low lighting always adds to the feeling of going within. A meditation room that is free from mess and clutter and carries simplicity is a quiet place. Remember that you might want to change the look and feel of your meditation room often, and indeed you should change it often. The reason being as you transform, grow and change from within you want to match the change on the outside. So there will be times you need zen like simplicity and other times you might need an opulant colorful place to be. I personally like to add a devotional space to my meditation room. I call it my alter. In the past I have used a bookshelf, a plank on 2 bricks, a side table and sometimes I created it just on the floor. I love putting beautiful pictures on there, a Buddha as I feel pulled to go within when I look at one, some candles and some flowers. I also put quotes of inspiration on it, whatever I need for that week to be reminded of to keep going. I like to change my alter regularly in order to keep it alive and fresh and feel inspired when I walk into my meditation room. 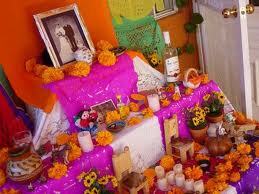 I have added a few pictures of alters and devotional spaces for your inspiration! The practical aspects of designing your space are as important as the look and feel of the room. As you think through all the practical aspects thoroughly the less distraction will there be for you during your meditation times. Do you need any sound proofing? A "please be quiet sign" on the door. Being able to control the light in the room is crucial. A sound system: Music might enhance your meditations greatly. Have items in reach like: water, tissues, journal and whatever else you like to use in your meditations.